A multinational team of astronomers involving the University of Adelaide has catalogued over 70 sources of very high energy gamma rays, including 16 previously undiscovered ones, in a survey of the Milky Way using gamma ray telescopes. Gamma rays are the highest energy form of light. They are studied by astronomers and astrophysicists around the world because they can be used to trace the origins of cosmic rays, elusive charged particles which are an important ingredient in the evolution of the Universe. 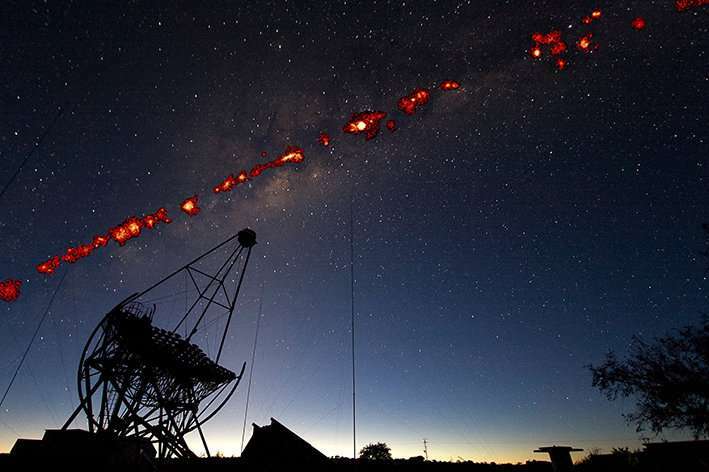 Using the High Energy Stereoscopic System (HESS) gamma ray telescopes in Namibia, the researchers have surveyed the Milky Way in gamma ray light for the past 15 years. The results have been published in 14 scientific papers in a special edition of the journal Astronomy and Astrophysics, including details of a particularly intriguing new source of gamma rays. "This particular source of gamma rays was found towards an unusual cluster of stars which harbours one of the Milky Way's most massive and energetic young stars, a luminous blue variable star called LBV1806-20," says Associate Professor Gavin Rowell, from the University of Adelaide's High Energy Astrophysics Group and leader of Australia's participation in HESS. "The cluster of stars also harbours a rare, extremely magnetic, neutron star known as a magnetar, but we think the gamma ray emission could be linked to the luminous blue variable star. "If the source is the luminous blue variable star, it is the first time that gamma ray emission has been linked to such a massive star. Many of the other gamma ray emission sources, in this very high energy band, have so far been linked to pulsars or supernova remnants (the remains of an exploding star). This would mean a new kind of gamma ray source, the first discovery of its kind. "We haven't, however, completely ruled out an association with the magnetar or the other stars of the cluster yet. But to be absolutely sure, we'll probably have to wait for far more sensitive gamma ray observations with the Cherenkov Telescope Array, the next gamma ray observatory now under construction in Chile." Other discoveries in the Milky Way detailed in the special edition include the sharpest image yet of a gamma ray source – a nearby supernova remnant – which will enable researchers to study this object at finer scale than before – and three new 'gamma ray shells' that are possibly examples of a new type of supernova remnant. "Interestingly, about half the catalogued sources still remain unidentified, an aspect which will inspire astronomers to search for answers using different kinds of telescopes, operating in the radio to the X-ray bands," says Associate Professor Rowell. The HESS team consists of scientists from Germany, France, the United Kingdom, Namibia, South Africa, Ireland, Armenia, Poland, Australia, the Netherlands, Austria and Sweden. HESS is a system of four 13-metre diameter and one 28m diameter telescopes sensitive to gamma rays that have 100 billion times more energy than optical light.